A number of walkers tackling A Dales High Way have expressed an interest in exploring other options around Addingham, including routes which stick to the higher ground of the watershed, and more direct options skirting Addingham village, avoiding any potentially muddy areas. There are a number of possible optional routes, three of which are outlined here. In the main though, they involve a degree of road walking (albeit on fairly quiet rural roads) and are generally less interesting than the main route. The Three optional routes explored here include a High Moor Option between Lanshaw Lad - the high point of the main route across Rombalds Moor - and Addingham High Moor. 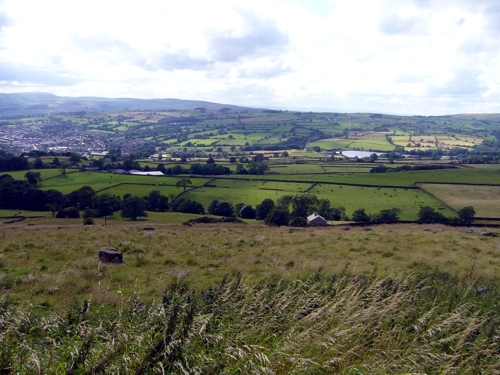 The Woofa Bank Option then looks at a route from Addingham High Moor to Draughton Height on Skipton Moor, sticking as closely as possible to the watershed. This though involves around 2½ miles of road walking. Finally the Turner Lane Option looks at a more direct route between Addingham High Moor and the western edge of Addingham at Causeway Foot, following the line of an ancient packhorse trail between Keighley and Addingham. This too invloves a mile and a half of road walking. These options may be of interest if time is pressing and you have no wish to visit Addingham, or after prolonged periods of heavy rainfall (such as experienced in the summer of 2012) when some of the fields around Addingham may be very muddy. 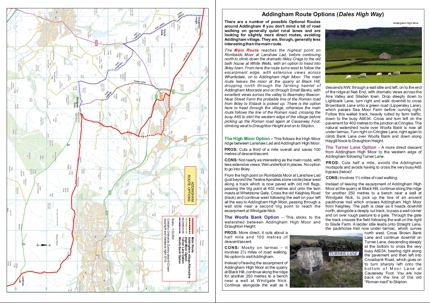 A map and route description of the Addingham Route Options can be downloaded here (PDF format).